Turtle island is a small, solitary island with a land mass of 2.9 square kms, located about 10kms off the coast of Toucheng in Yilan County, Taiwan. The island used to be a military controlled area and it is not until the year 2000, the government allows access for tourism purposes. The island has volcanic terrain that from certain angles looks like a floating turtle in the sea, hence the name “Turtle island”. 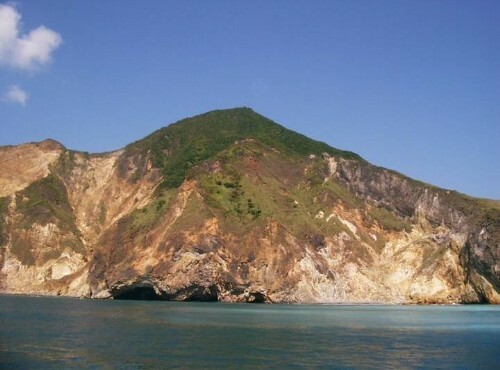 Among the features of the island are high cliffs, steaming fumaroles, mountain peaks, sea-eroded caves, a lake, rich in marine ecological resources and the best of all, welling underwater hot springs. The seabed hot spring offers a murky smell of sulfur in the area, the milk-colored hot spring spurting from the seabed, mixing the sea water with a lighter blue in color, locals also given this area a nickname of “The Ying Yang Sea”. Under the water, hot water and bubbling everywhere from cracks in the seabed. Wushih Harbor is the gateway for all visitors coming or going to Turtle Island. Wushih Harbor can be reached several ways. A. (Scenic) Drive along Seafront Provincial Highway Tai-2 towards Yilan County; pass through Beiguan, before arriving at Wushih Harbor. B. (Direct) Drive along NO.5 Beiyi Freeway and turn left at Ercheng onto County Road #191, drive all the way to Dingpu, and take Provincial Highway Tai-2 to Wushih Harbor. Drive along Suhua Provincial Highway Tai-9, and then get onto the Seafront Provincial Highway Tai-2, heading towards Toucheng which is just before Wushih Harbor. A.Take Yilan Line of Taiwan Railway, get off at Yilan Station, and take a bus to Wushih. B.Take the “King Bus” from Taipei federal Highway Bus Terminal towards Yilan and Hualien, and get off at Wushih Harbor Station.